L'Oreal Infallible Shadows & CVS Beauty Clearance haul! Hello everyone! Today is my birthday and I've been running around doing lots of important birthday things like renewing my driver's license, eating birthday lunch with my mom (yummy 양장피! ), and posting a birthday blog post on my blog. I might even eat cake later tonight, who knows! I'm crazy! Hehe. It seems like retailers lately are really taking advantage of it being my birthday this month. (You know I'm kidding! I guess people buy gifts for other people sometimes too.) I'm not gonna lie though, I have thoughtfully made my contribution to our economy thanks to the holidays this year and my birthday is no exception. In lieu of the season, as well as some decent new products and sales, I bought some new stuff on the cheaps and want to share my haul with you! First of all, can I just say the L'Oreal Infallible shadows are pretty fantastic? The wear on these is ridiculously good and they do NOT crease on me, which is awesome for those monolid/sok ssangapul (hidden crease)/wonk eye days. I've cried through wearing this and my makeup was surprisingly intact later on. 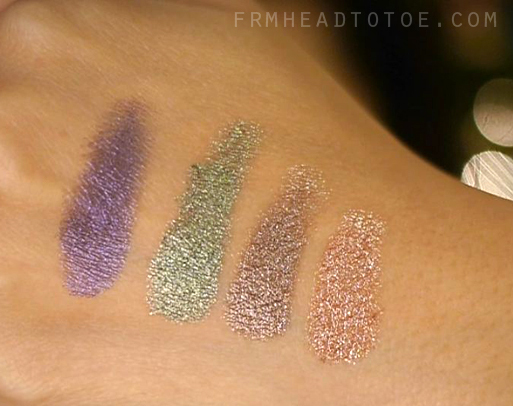 Here are some swatches of Perpetual Purple, Golden Sage, Bronzed Taupe, and Amber Rush. This was just a screencap from my video, but you can see how pigmented and metallic they are! In real life they are even more saturated and vibrant than shown here. I for sure need to go back and get the deeper colors for doing easy monolidded looks! As for the big beauty clearance, I wasn't even really planning on hitting up CVS but I spotted the big red letters as I picked up some alterations and couldn't resist. If you'd like more info on the CVS sale including a "Master List" of items to check prices on, visit Nouveau Cheap, my favorite drugstore beauty blog. She has helped me on endless hunts through drugstore beauty aisles and I credit a lot of my drugstore favorites to her hard work! For anyone who picks up Revlon Colorstay Eyeshadow quad in Copper Spice, you can check out my previous tutorials using it here and here. I'm going to try and record a quick birthday Outfit Of The Day before going to dinner tonight. I hope you enjoyed the haul and thank you SO MUCH for all your sweet birthday wishes on twitter and youtube! You don't know how immensely my heart feels lifted when I read them, knowing you guys took the time to send me your warm wishes. <3 This birthday I feel so loved and it wouldn't be the same without your continual love and support. THANK YOU! Happy birthday! I love the colors. You look gorgeous. I have the revlon quad i do like those but those eyeshadows look amazing! I also wish they had physicians formula here in the uk.. Happy birthday !! I just bought 2 L'oreal infallible shadows after I watched your videos.and they're amazing!! Happy birthday Jen! Love your blog! I especially like your makeup tutorials! I love Nuevo Cheap too. Just started following her. Had no idea she's your friend. Nice haul. I want that Revlon palette! How does the physicians formula foundation compare with the powder with spf 15? I don't comment a lot, I religiously read your posts but sometimes have nothing to say, but happy birthday and keep up the good work! You've been an inspiration, especially because I'm really bad at applying makeup! happy bday! i hope you enjoyed your day. i really love the bronze taupe color and also am thinking about trying the powder foundation. idk if my skin has problems with foundation or powder but i still want to try it. lolz. It looks like I'm going to have to check out CVS. I love Nouveau Cheap. Being a student living on such a tight budget, it quickly became one of my favorite blogs. the eyeshadows look great! love how they're shimmery! Hi Jen, I actually have a quick question to ask of you. I actually went to the CVS today and saw the Revlon lipsticks on sale too (well they were buy on get one 50% off I believe?). Anyway as I was looking through the lipsticks, I noticed that the Revlon Moon Shine lipsticks (I think those were the ones I was looking at) had not only the color's name labeled on it but it also put the finish on it. So my question to you is what is the difference between the finishes of lipsticks and if possible you do a blogpost or video about it? A couple months back I actually bought some lipsticks online and I didn't understand the finishes and they turned out to have way too much shimmer in it for my liking. If you could do something about this it would be really helpful! Thanks! Happy birthday Jen! I always not miss your blog post since ur 26th yo! Happy Birthday! Those L'Oreal Infallible shadows are so so gorgeous! I went to CVS today but I didn't see any huge beauty sale in my area, but I will keep my eyes on them^^!!! thanks for the video and post ^_^! Wow! You snagged some awesome deals. Yes, CVS is more expensive than other stores but the cash back and coupons seem to balance out the price diff. Happy Birthday and wishing you many, many more! I hope that you had an awesome day and that all of your birthday wishes came true. We've always had L'Oreal Infallible shadows here in Belgium (being next door to France and all that), but I think the shadows are numbered/named differently! I'll have to double-check to make sure, but from what I can see on their website it's indeed different. All of them look gorgeous on you though (of course, wouldn't imagine them being otherwise)! Happy Birthday! Stay pretty and healthy always! Happy Birthday to you, Jen! Have a great one ! Seng eel chook ah heh, unni! :] I'm on a no-buy but would love to pick up those eyeshadows............. yikes. Enjoy your day! Some dresses are super cute and would make a great birthday treat! Happy birthday, Jen! Thanks for all the great videos! Happy Birthday! I can't believe the L'oreal infallible shadows are so richly colored! I should add some onto my Christmas wishlist. Also, I love the nail polish you're wearing in your video! What is it? i just had a quick question. i looked up the shades you own in the l'oreal website and couldn't find them?? Happy birthday Jenn, btw same name over here hahaa! I also purchased a L'oreal Infallible Shadow recently and I am in love! please check out my blogpost about it! Hi Jen, Happy birthday!! I have a good news here, I went to CVS today and surprisedly saw they have the L'Oreal Infallible shadows now for $7.99! Also some other good new product. What's even better is L'Oreal have the buy one get one 50% off right now. So I pick 4 colors the same as you did only spent $24. They are so amazing. But I am really a rookie for make up. Would you may be do a tutorial using these next time? Thanks! hi jen! happy birthday! i saw your review on the revlon lip butter lipsticks but didn't see that you purchased the strawberry shortcake color. can you tell me how its different from the cotton candy shade? How would you say the quality on these eyeshadows compares to the Urban Decay Naked Palette. I bought about 8 of the Infallible shadows but am re-thinking that maybe it would be a better investment just to get the Naked 2 palette? But the quality of these Infallible shadows is really nice!